OfficeMax Continuous Computer Form Paper, 9-1/2''W X 11''L, 3 Part Color Carbonless Paper (white, canary, pink), Blank, by OfficeMax at LDP Graphic Design. MPN: 4328321154. Hurry! Limited time offer. Offer valid only while supplies last. Packaged at 1100 forms per carton, this 3 Part Carbonless, 9-1/2''W X 11''L, blank continuous form is ideal for all reports printed on impact printers. 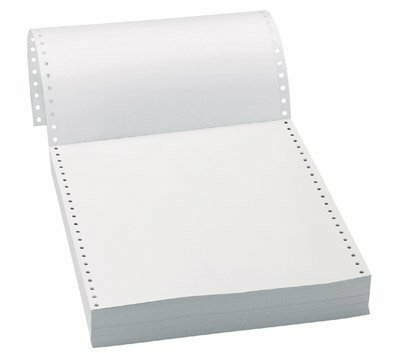 Packaged at 1100 forms per carton, this 3 Part Carbonless, 9-1/2"W X 11"L, blank continuous form is ideal for all reports printed on impact printers. The first page of this form is white, the second part is canary, and the third part is pink, making it easy to determine how to distribute the copies. This 3 part form has 1/2" standard strip off perforations to allow you to break the form down to 8-1/2"W X 11"L after printing.